Hello everyone. I'm finally back with Day Eight of the Christmas Card Series 2015. Today is a super quick card and video and would be easily mass produced and actually after I filmed and did this video I actually did mass produce some of these to give away. 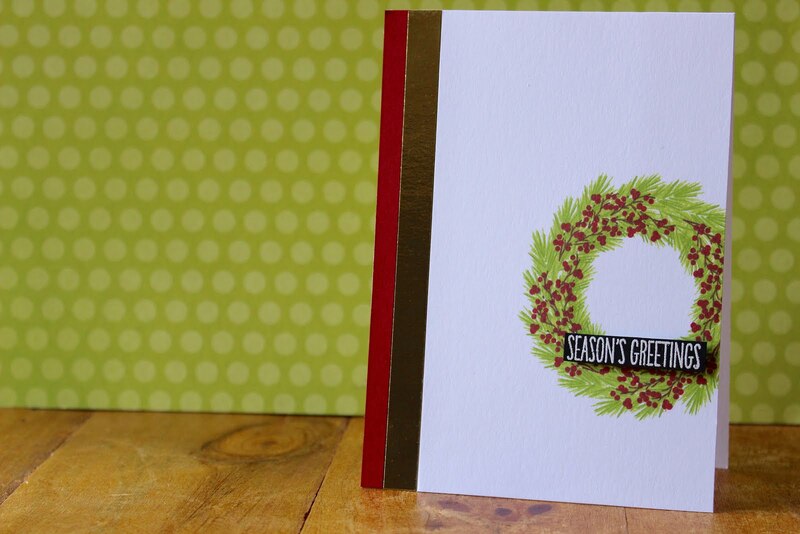 So onto the card, todays card features WPlus9 stamps, Simon Says Stamp inks and the MISTI. So to start off with todays card I just took a piece of Neenah Solar White Cardstock and cut it down to approx 3 1/4" by 5 1/2". I then used my MISTI tool to stamp down the images from the Woodland Wreath stamp set by WPlus9. I first started off with the 2nd layer stamp - which was a mistake, but honestly it doesn't really matter, so I stamped that layer in some Green Leaf Ink by Simon Says Stamp. I then took the first layer stamp and stamped that down in Jellybean Ink by Simon Says Stamp. For the third layer stamp, which is the branches and I stamped that down in Dark Chocolate Ink also by Simon Says Stamp. Then the last layer is the berries and I stamped those down in some Lipstick Red ink by Simon Says Stamp. That finished off the colour stamping portion, so now I moved onto the sentiment. I took the Season's Greetings sentiment that has been a favourite throughout this series so far, stamped that onto some scrap Black Cardstock by Simon Says Stamp with some Versamark Ink and heat embossed it with white and then cut it down to size and that finished off basically the card. All I did next was cut down two little scraps of Red and Gold Foil Card stock stuck them onto my cardbase (you could even leave out this step if you wanted to make it even more simple to mass produce), which measures 4" x 5 1/2" and then adhered down the stamped panel flat onto the card base. So that finishes up my super simple card for today - even the video is only like 3 minutes long! The link for the video is down below. I hope you enjoyed the card and video today and I would love to hear your thoughts on todays card! Thanks for stopping by today and I'll catch you all soon.